This study examines the carbon footprint of a proposed biomass incinerator in Minneapolis and Saint Paul, Minnesota. This research was integrated as a service-learning project into the curriculum of an undergraduate differential equations course. Mathematical models were developed and analyzed to examine the local contribution of emissions to the atmosphere and the extent of land needed to offset incinerator emissions both in the short (daily) and long (yearly) term. [more] Our results show the sensitivity of atmospheric carbon content to the incinerator output rating, area and type of land dedicated for offsets, and atmospheric wind speed. The amount of managed land ranges from 7,000–20,000 hectares of land, or approximately the area of Saint Paul. The land requirements seem feasible in the context of the amount of available (unmanaged) land both locally and worldwide, but these requirements are diminished given the potential air quality effects resulting from biomass incineration. The Rock-Tenn paper recycling plant located in Saint Paul, Minnesota employs over 500 people and contributes significantly to the economic health of the greater Minneapolis-Saint Paul metropolitan area (Nelson 2007). The company initially had its thermal energy supplied by Xcel Energy, the local power provider. In late 2007, Xcel Energy decommissioned the plant that supplied Rock-Tenn’s thermal energy. Alternative sources of energy were needed to maintain the long-term sustainability of the recycling plant. Refuse derived fuel (RDF) was a proposed alternative to provide energy for the recycling plant. This technique derives energy from the incineration of plant material, refuse, and compost (Nelson 2007). RDF is an example of bioenergy. Generally defined as the use of plant material to supply energy, bioenergy supplies 15 percent of the world’s energy needs (Lemus and Lal 2005). Bioenergy is an alternative energy to fossil fuels. Trees, through the process of photosynthesis, convert carbon dioxide into carbon, so any combustion of tree residue (and associated release to the atmosphere of this comparatively recently-fixed carbon) theoretically results in no net change of atmospheric carbon (Smith 2006). Surrounding the Rock-Tenn plant are residential neighborhoods. In response to the proposed plan of the biomass incinerator, a grassroots organization, Neighbors Against the Burner, formed to oppose the incinerator, citing air quality effects on health (Pope et al. 2002) as one of its main objections. Based on the strong community response, in November 2008 the Saint Paul City Council passed a resolution against having the biomass incinerator be the energy source for Rock-Tenn. The Council advocated investigation of other alternative energy options, such as using biogas from anaerobic digestion (Saint Paul City Council 2008). How much do incinerator emissions elevate local atmospheric carbon? What conditions need to be satisfied for carbon neutrality both short and long term? For the purposes of this study, carbon neutrality implies zero net change in the atmospheric carbon content. This study was integrated in the curriculum for a one-semester differential equations course. At the beginning of the term the instructor introduced the project objectives. The students formed teams to investigate the project objectives through construction and analysis of a mathematical model. The teams reported updates with the instructor throughout the semester. Additionally, a representative from Neighbors Against the Burner attended a class session to answer student questions and provide feedback. At the end of the term, students presented their results and wrote a report describing their results in the context of the mathematical, environmental, and civic dimensions of the project. The results presented in this study derive from these student projects. Emissions from the incinerator are assumed to occur at a constant rate, dependent on the emission type and incinerator output rating. To maintain carbon neutrality, we assume the existence of an active forest that removes carbon. With these assumptions, each team then had to quantify the appropriate mathematical model based on Equation 1. The mathematical models are qualitatively described below; additional mathematical descriptions are in the Appendix. Emissions Contribution to Atmospheric Carbon. Emissions from the incinerator and subsequent dispersion into the atmosphere create a plume of incinerated material and gases. This model, derived from models of contaminant transport in fluids (Brannan and Boyce 2007; Falta Nao and Basu 2005), describes the rate that incinerated carbon enters the plume. The biophysical process term is assumed to be directly proportional to the wind speed versus higher wind speed values decrease the amount of carbon near the incinerator and increase the concentration of carbon in the plume. Outputs from this model could subsequently be used to quantify spatial distribution of carbon in the plume through diffusion, advection, and other atmospheric properties. The incinerator emissions are inversely proportional to the smokestack output area, assumed to be 250 square meters for this study. The flow (in terms of volume per time) of emissions into the smokestack must equal the flow of emissions into the atmosphere. If the area of the smokestack increases, the rate of change of atmospheric carbon must decrease to maintain the constant flow of emissions. Short and long term carbon neutrality. Long term atmospheric measurements of carbon dioxide over various ecosystems have shown the short and long term responses of ecosystems to carbon uptake through the dynamic processes of photosynthesis (conversion of carbon dioxide to simple sugars) and respiration (release of carbon dioxide to the atmosphere) (Baldocchi et al. 2001; Wofsy et al. 1993). Aggregated up to annual timescales, this balance between photosynthesis and respiration typically is negative (meaning the photosynthesis flux is stronger than all respiratory fluxes), indicating the ecosystem is a sink of carbon to the atmosphere. Diurnal fluctuations in temperature and moisture, seasonal variation, species composition, and plant species successional stage all contribute to an ecosystem being a given source or sink of carbon to the atmosphere (Baldocchi et al. 2001). The productivity of a forest (or its ability to decrease atmospheric carbon) can therefore be quantified with long-term records of net carbon uptake. As previously stated, we assume the existence of a forest that will offset incinerator emissions. In our models this is represented by having the emissions term inversely proportional to the forest area. As forest area increases, emissions contribute proportionally less to atmospheric carbon because there are more trees to remove atmospheric carbon. The biophysical process term was quantified in two different ways to describe short term (daily) and long term (yearly) carbon uptake. Short term carbon uptake was modeled with a dynamic, periodic term modeled after patterns of diurnal net ecosystem carbon exchange (Wofsy et al. 1993). Long term carbon uptake or forest productivity was assumed to occur at a constant rate, with values determined from Baldocchi et al. (2001). Figure 1 shows results of the influence of wind speed on atmospheric carbon content. 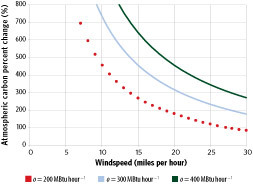 As wind speed increases, local emissions decrease independent of burner output. 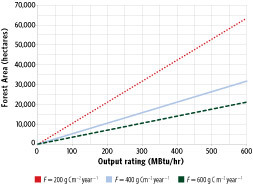 Increasing the incinerator output rating o (measured in MBtu per hour) also increases atmospheric carbon content, inferring a higher concentration of carbon in the plume. 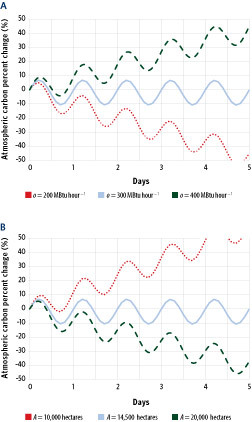 Figures 2a-b show model results of the daily temporal change in atmospheric carbon content. Vertical axis values in Figures 2a-b are scaled as a percent change from the initial atmospheric carbon content. Positive vertical axis values suggest that the incinerator is increasing atmospheric carbon dioxide levels, or a “carbon-positive” incinerator, whereas negative vertical axis values indicate the incinerator is “carbon-negative,” or that the forest removes additional carbon dioxide beyond incinerator emissions. The periodic behavior in atmospheric carbon results from the selection of a periodic function for the carbon uptake function (see the Appendix). Daytime has a stronger net carbon uptake, indicating trees in the forest are removing carbon from the atmosphere through photosynthesis, thereby decreasing atmospheric carbon content. As photosynthesis is a light-dependent reaction, during the night the forest is a source of atmospheric carbon. Figure 2a reflects short term temporal emissions when the output rating of the boiler o is varied from 200 to 400 MBtu per hour. These output ratings were estimated from similar steam-producing systems as the one studied by the students (Energy Products of Idaho 2009). In all cases, it is assumed that there is an actively growing forest of 14,500 hectares (approximately the area of Saint Paul) to offset incinerator emissions. For an output rating of 400 MBtu per hour the atmospheric concentration is increasing at a constant rate of 10 percent per day, whereas for an output rating of 200 MBtu per hour the forest is large enough to reduce atmospheric carbon content by 10 percent per day. Figure 2b shows the effect of changing the forest area on atmospheric carbon content. If the forest area is reduced to 10,000 hectares, then the incinerator becomes a source of carbon to the atmosphere with emissions growing at a rate of approximately 10 percent per day, indicating that the forest itself is not large enough to offset emissions from the plant. On the other hand, if the forest area is increased to 20,000 hectares, then the incinerator is “carbon negative,” decreasing atmospheric carbon concentrations approximately 10 percent per day. Figure 3 shows the area of land that would need to be dedicated to maintain long-term carbon neutrality as a function of the output rating. As the output rating increases, a larger forest area will be needed to sustain carbon neutrality. The slope of the linear dependency in Figure 3 depends on the forest productivity (F) in removing carbon dioxide from the atmosphere. Different values of F result from the overall forest species composition (Baldocchi et al. 2001). The less productive forest (smaller values of F) will require a larger area to offset incinerator emissions. A strong concern to the incinerator is the decrease in air quality in the neighborhoods surrounding the recycling plant. The results shown in Figure 1 qualitatively support this concern. Higher incinerator output ratings increase the amount of atmospheric carbon in the emissions plume. While atmospheric carbon decreases with increasing wind speed, conservation of mass infers that this carbon is dispersed to neighborhoods surrounding the incinerator. Recent studies have shown linkages between public health and air quality (Pope et al. 2002; Zhang and Smith 2007). In addition to the carbon released through incineration, aerosols and other particulate matter may also be released into the atmosphere by incineration. While these other aerosols were not investigated in this study, the models presented here could easily be adapted to take these into consideration. Additionally, coupling this model to an atmospheric transport model could quantitatively describe increases in carbon or other aerosols and the spatial extent to neighborhoods around the incinerator. Our results indicate that the amount of forest area needed to maintain carbon neutrality ranges between 7000–20000 hectares, depending on the type of species planted and the output rating (Figures 2 and 3). These estimates are a small fraction of land both locally and worldwide that could be dedicated to bioenergy. In Minnesota approximately 563,000 hectares of land could be rehabilitated to support bioenergy crops (Lemus and Lal 2005). Worldwide, the amount of land in need of restoration from degraded agricultural soils is approximately 1965 million hectares (Lemus and Lal 2005), which is a large proportion of the 2380 million hectares of land not classified as urbanized or protected (Read 2008). The total area of managed, or plantation, forests are 187 million hectares, consisting of 5 percent of worldwide forest area (Mead 2005). Dedicating land to bioenergy crops helps to mitigate increasing levels of atmospheric carbon dioxide, restore soil organic carbon that were depleted from agricultural practices, and prevent erosion (Lemus and Lal 2005; Lal 2004; Sartori et al. 2006). In spite of these benefits and comparatively small area of land required to offset incinerator emissions, other factors not accounted for in our models would modify our estimates for the amount of land needed to offset emissions. First, technological advances will be required for their application, which may not be appropriate at all regional and local levels (Smith 2008). Second, bioenergy should be part of a suite of strategies targeted to mitigate climate change, which include the reduction of existing emissions through changes in consumption and improving agricultural efficiency (Smith 2008; Rhodes and Keith 2008). Third, life-cycle analyses for bioenergy crops (Adler, Del Grosso, and Parton 2007; Spartari, Zhang, and Maclean 2006) have shown a slight decrease in their mitigation potential when the growth and maintenance of the bioenergy crop (which requires energy) is taken into consideration. Additionally a recent study by Fargione et al. (Fargione et al. 2008) has quantified a substantial carbon “debt” incurred by clearing land for bioenergy crops. Further investigation into these factors is needed to refine and quantify the carbon footprint of the incinerator. Key learning outcomes of the project were to (a) develop and apply differential equation models to a contextual situation, (b) interpret results in the context of the carbon neutrality of the burner, and (c) provide valued recommendations based on the observations of the mathematical models. Based on the evaluations, it can be concluded from the student assessments that the first two outcomes were met (the construction, application, and interpretation of mathematical models). The lower ranking of the community connection category indicated not fully meeting the final objective. While students articulated recommendations on model results, a stronger connection to the relevant stakeholders in the issue (Neighbors Against the Burner and Rock-Tenn Recycling) could have been made. Multiple student evaluations expressed the desire for a tour of the recycling plant, or have more interaction with local community organizations beyond the mid-term visit. It would have been desirable to have a public forum of presentation of results, thereby increasing the visibility of the project in the college community. This project has shown the qualitative contribution of the biomass incinerator to local atmospheric carbon content and the amount of land required to offset incinerator emissions. The project articulated the value of mathematical models and connected classroom learning to a civic and environmental issue. The author would like to thank the students enrolled in the spring 2008 section of MAT 247: Modeling and Differential Equations for their diligent work and efforts; Mary Laurel True of the Center for Service, Work and Learning at Augsburg College; Benjamin Stottrup; and Tom Welna of Neighbors Against the Burner. Special thanks are expressed to the Barbara Farley, Vice-President of Academic Affairs at Augsburg College for conference travel support to present preliminary results at the Mathematical Association of America MathFest 2008. John Zobitz (zobitz@augsburg.edu) is an assistant professor of mathematics at Augsburg College in Minneapolis, Minnesota. John received his Ph.D. from the University of Utah in 2007, specializing in mathematical biology. Current research includes the development of mathematical models quantifying forest carbon uptake from automated data streams. He continues to find ways to intersect environmental mathematics with his mathematics teaching at all levels of the curriculum. The quantity described in all models is the atmospheric carbon density (grams carbon per square meter, or g C m-2), represented with the variable c. Models were expressed as a differential equation, and where appropriate, solved directly or with standard numerical techniques (Blanchard, Devaney, and Hall 2006). The initial condition (c0) for all models assumes a fixed CO2 mixing ratio of 385 parts per million by volume (National Oceanic and Atmospheric Administration 2009; Peters et al. 2007), assuming an air density of 44.6 mol m-3(Campbell and Norman 1998) uniformly distributed up to 21.5 m above the ground surface. Energy units are expressed in MBtu, or a million British thermal units. where c, t, o, and v are defined above, t is time (hours), α is a conversion factor from grams to pounds (453.59 grams pound-1), ε is a conversion factor to determine the amount of carbon in carbon dioxide (0.2727 g C g-1 CO2), E is the emissions fuel type for wood (assumed to be 195 lbs CO2MBtu-1 [Palmer 2008]), o is the boiler output rating, S is the incinerator total smokestack area (assumed to be 250 m2). For a circular smokestack this would be a diameter of 17.8 m, and m0 is the initial atmospheric carbon volume (0.206 g C m-3). Assuming the carbon dioxide concentration equilibrates rapidly to steady state (that is, dc/dt = 0), an expression can be determined that relates atmospheric carbon content c to the wind speed v, as shown in Figure 1 for different values of the output rating o.
where c, t, α, ε, E, and A are defined above. The periodic function represents the diurnal uptake pattern typically found in a forest (Wofsy et al. 1993). For this study, f1 = 0.1 g C m-2 hr-1, f2 = π/12 ≈ 0.262 hr-1, f3 = 0.524, and f4 = 0.05 g C m-2 hr-1. The values of f1, f2, f3, and f4, were visually determined from data of the average diurnal uptake pattern for a coniferous forest during the peak summer carbon uptake period (Monson et al. 2002; Zobitz et al. 2007). where all variables are defined above. Again assuming steady state dynamics (or no change in atmospheric carbon) a linear equation between A and o can be formulated and is represented for different values of F in Figure 3. Adler, P.R., S.J. Del Grosso, and W.J. Parton. 2007. “Life-cycle Assessment of Net Greenhouse-Gas Flux for Bioenergy Cropping Systems.” Ecological Applications 17 (3): 675–691. Baldocchi, D., et al. 2001. “FLUXNET: A New Tool to Study the Temporal and Spatial Variability of Ecosystem-Scale Carbon Dioxide, Water Vapor, and Energy Flux Densities.” Bulletin of the American Meteorological Society 82(11): 2415–2434. Blanchard, P., R.L. Devaney, and G.R. Hall. 2006. Differential Equations. 3rd ed. Belmont, CA: Thomson Brooks/Cole. Brannan, J.R., and W.E. Boyce. 2007. Differential Equations: An Introduction to Modern Methods and Applications. Hoboken, NJ: John Wiley & Sons. Campbell, G.S., and J.M. Norman. 1998. An Introduction to Environmental Biophysics. 2nd ed. New York: Springer. Falta, R.W., P.S. Nao, and N. Basu. 2005. “Assessing the Impacts of Partial Mass Depletion in DNAPLE Source Zones I: Analytical Modeling of Source Strength Functions and Plume Response.” Journal of Contaminant Hydrology 78(4): 259–280. Fargione, J., et al. 2008. “Land Clearing and the Biofuel Carbon Debt.” Science 319: 1235–1238. Hesser, G. 1998. “On the Shoulders of Giants: Building on a Tradition of Experiential Education at Augsburg College.” In Successful Service-Learning Programs: New Models of Excellence in Higher Education, ed. E. Zlotkowski. Bolton, MA: Anker Publishing Company. Lal, R. 2004. “Soil Carbon Sequestration Impacts on Global Climate Change and Food Security.” Science 304: 1623–1627. Lemus, R., and R. Lal. 2005. “Bioenergy Crops and Carbon Sequestration.” Critical Reviews in Plant Sciences 24: 1–21. Mead, D.J. 2005 “Forests for Energy and the Role of Planted Trees.” Critical Reviews in Plant Sciences 24: 407–421. Monson, R.K., et al. 2002. “Carbon Sequestration in a High-Elevation, Subalpine Forest. Global Change Biology 8 (5): 459–478. National Oceanic and Atmospheric Administration, Earth System Research Laboratory. “CarbonTracker” 2009. http://carbontracker.noaa.gov (accessed June 1, 2009). 032907.pdf (accessed December 14, 2009). Palmer, G. 2008. Biomass Emissions Data. Personal communication to Rock-Tenn Community Advisory Panel (January 14, 2008). Peters, W., et al. 2007. “An Atmospheric Perspective on North American Carbon Dioxide Exchange: CarbonTracker.” Proceedings of the National Academy of Sciences 104 (48): 18925–18930. Pope, C.A., et al. 2002. “Lung Cancer, Cardiopulmonary Mortality, and Long-term Exposure to Fine Particulate Air Pollution.” Journal of the American Medical Association 287(9): 1132–1141. Read, P. 2008. “Biosphere Carbon Stock Management: Addressing the Threat of Abrupt Climate Change in the Next Few Decades: An Editorial Essay.” Climatic Change 87: 305–320. Rhodes, J.S., and D.W. Keith. 2008 “Biomass with Capture: Negative Emissions Within Social and Environmental Constraints: An Editorial Comment.” Climatic Change 87: 321–328. Saint Paul City Council. 2008. Resolution 08-1281, November 19, 2008. Sartori, F., et al. 2006. “Potential Soil Carbon Sequestration and CO2 Offset by Dedicated Energy Crops in the USA.” Critical Reviews in Plant Sciences 25: 441–472. Smith, P. 2006. “Bioenergy: Not a New Sports Drink, but a Way to Tackle Climate Change.” Biologist 53(1): 23–29. Smith, P., et al., 2008. “Greenhouse Gas Mitigation in Agriculture.” Philosophical Transactions of the Royal Society B: Biological Sciences 363 (1492): 789–813. Spartari, S., Y. Zhang, and H.L. Maclean. 2006. “Life Cycle Assessment of Switchgrass- and Corn Stover–Derived Ethanol-Fueled Automobiles.” Environmental Science and Technology 39: 9750–9758. Wofsy, S.C., et al. 1993. “Net Exchange of CO2 in a Mid-Latitude Forest.” Science 260: 1314–1317. Zhang, J., and K.R. Smith. 2007. “Household Air Pollution from Coal and Biomass Fuels in China: Measurements, Health Impacts, and Interventions.” Environmental Health Perspectives 115: 848–855. Zobitz, J.M., et al. 2007. “Partitioning Net Ecosystem Exchange of CO2 in a High-Elevation Subalpine Forest: Comparison Of A Bayesian/Isotope Approach to Environmental Regression Methods.” Journal of Geophysical Research-Biogeosciences 112, G03013, doi:10.1029/2006JG000282. [br clear] Please click the link above to download a PDF copy of the above article.